The Mens Yukon Parka from Jack Wolfskin is an ultra robust Parka that is built to cope with the toughest wilderness adventures.With the Yukon Parka you're equipped to take on Canadian Winters and Nordic storms. After a whole day out In the pourIng raIn, you'll arrive back at camp In the evenIng completely dry. Even when you're carryIng a heavy trekkIng pack, the Yukon will keep you dry, because the shoulders are reInforced with extra robust, extra waterproof Texapore O2+ Oxford. 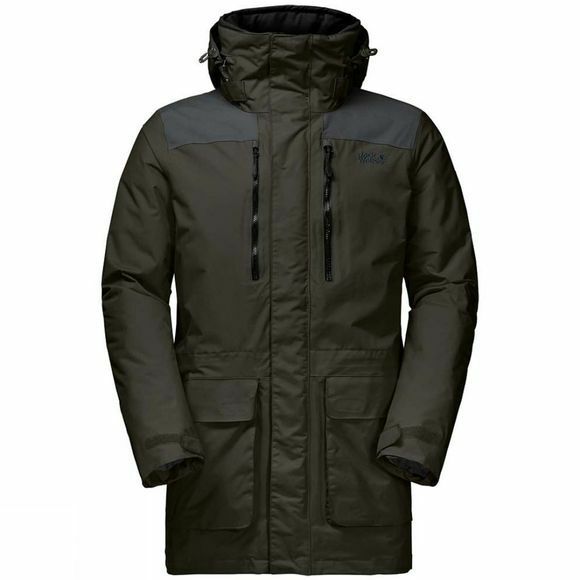 This Parka is Incredibly warm, too, thanks to the Microguard synthetic fibre Insulation, which retaIns its thermal performance even when damp. The Yukon is equipped with an extra High collar. This can be adjusted to give a snug fit, and the Hood can be stowed away Inside it.